LASER TUBE: PRO 150w - Available German ROFIN 150w. REFRIGERATOR CHILLER: YES, SL-1 Included. 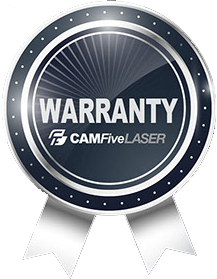 CAMFIVE LASER MC84 CUTTER EQUIPPED WITH 150W GLASS LASER TUBE AND 8 X 4' DUAL METAL & NON-METAL FULL SHEET CAPACITY worktable. 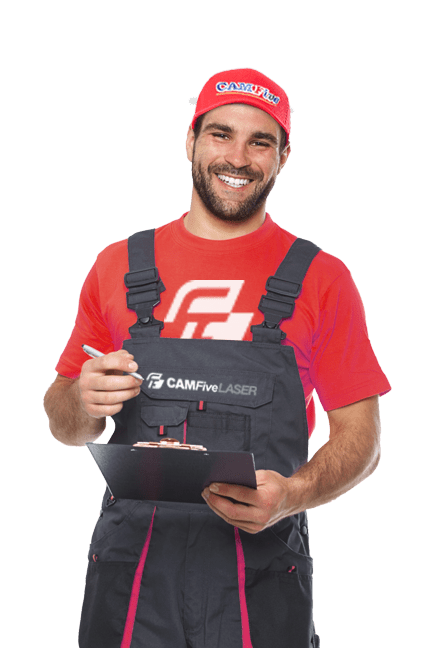 Our CAMFive Laser Metal and Non-Metal Cutter Model MC84 delivers high-quality metal cutting and is effectively used in metal shops and other industries that require accurate finish on their final products. It comes equipped with a high precision Servo movement system (Mitsubishi) and is also capable of cutting other thick materials such as wood and acrylic. It offers a stable and precise drive system with a German displacement axle and fast Japanese servo driving motors. The optical system has a German design lens that has been optimized for outstanding performance during cutting and engraving on different materials. LASER TUBE: 150w PRO model - Available German ROFIN 150w Rechargeable Laser Tube. Laser Type CO2 High-temperature resistant glass tube or German ROFIN Metal rechargeable Laser Tube. Laser Power 150W (Available Upgrade to Rofin 150w). Machine Dimensions 77” Length x 46” Width x 52” Height.